Total listings for the U.S. jewelry industry were down 5% percent year-on-year: at the end of Q3, there were 26,246 U.S. listings, compared to 27,479 last year. When Canadian listings are added in, the total at the end of Q3 was 27,492; down 4% from 28,743 in 2016. 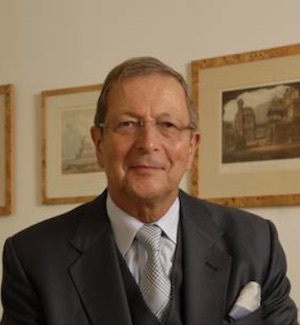 Speaking of our northern neighbor, Canadian luxury jeweler Birks sold Mayor’s, its 17-outlet U.S. division, to UK-based Aurum, which owns Mappin & Webb and Watches of Switzerland and was seeking a viable entrée into the U.S. market. Birks later announced plans to open five new stores across Canada. A Mayor's store in Florida. Business and economics: 2017 was a solid year for most luxury jewelers. The majority of jewelers polled by The Centurion reported a very strong holiday season. More than half of respondents (55%) were up over last year, and more than a quarter were up by more than 10% over the 2016 holiday season. As mentioned above, a strong stock market is good news for jewelers. So is a growing appreciation for small local businesses over big national chains, both of which were evidenced in jewelers’ total year sales: 61% of respondents reported a positive year for 2017, with 41% up at least 6% for the total year and 19% ahead more than 10%. But challenges remain. Outside the jewelry industry, many retailers are struggling with declining foot traffic and competition from online sales. In the industry, both Tiffany and Sterling started the year with disappointing sales and shakeups in the C-suites. Is a collaboration with Lady Gaga enough to revitalize Tiffany's moribund sales? Retail shifts: All retailers—not just jewelers—worry about digital disruption, economics, and changing consumer preferences. But non-jewelry retailers are most worried about cybersecurity, something that hasn’t yet impacted our industry. When The Centurion polled luxury independent jewelers to see what keeps them up at night, we found little change from what’s been worrying them: changing consumer tastes and shopping habits. Major changes are still in the wind for jewelers and other retailers, as consumers increasingly turn to options like the rental economy as a means of acquiring luxury, and conspicuous consumption gives way to more intangible luxury. And while the female self-purchase market has been discussed in our industry for decades, a new survey shows many jewelers still aren’t providing women with the kind of shopping experience they need. It’s an opportunity for jewelers that do offer the right mix of product and experience, because even with today’s casual lifestyles, a key fashion website says half of all “must-have” accessories for women are fine jewelry. And the luxury jewelry category is gaining appeal as a store of wealth. Disruption in the jewelry and gem industry isn’t unique to the United States, says one gem dealer. 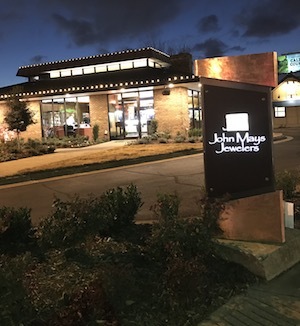 But jewelers who aren’t afraid to take a chance on revamping their store’s presence or trying entirely new ideas are more likely to be rewarded for their efforts, as John Mays and Michael Greene can attest. Above: John Mays' new location is a tremendous success. 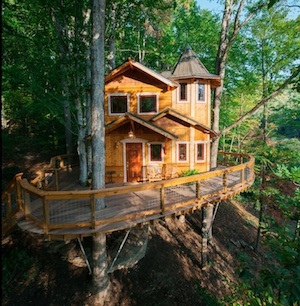 Below: Michael and Eva Greene's treehouse was featured on television. The couple owns several jewelry-themed guesthouses. Digital: Whether eagerly or grudgingly, successful luxury jewelers are embracing technology. Unfortunately, so are gray marketers, and a study by digital marketing analysts L2 found that jewelers who don’t offer e-commerce are not only giving up potential sales of their own, they’re inadvertently helping online gray marketers who have invested heavily in SEO, especially for luxury watch brands. L2 says 70% of in-demand luxury jewelry and watch brands end up on Amazon, despite efforts to quell unauthorized distribution. But there’s good news for jewelers: a giant leap was made toward sales tax fairness when Amazon began collecting sales tax from shoppers in any state that has sales tax, something jewelers have been advocating for years. Something to smile about: Amazon is now collecting sales tax from all shoppers in any state that has a sales tax. Generational shifts: Although store closings declined, the number of jewelers nearing retirement age hasn’t. It’s is a top-of-mind subject for many retailers, and was a central focus of the education sessions at the 2017 Centurion Scottsdale show. Storeowners shared their own strategies for creating wealth and avoiding inheritance taxes during transition, as well as how to foster positive and effective intergenerational communication. 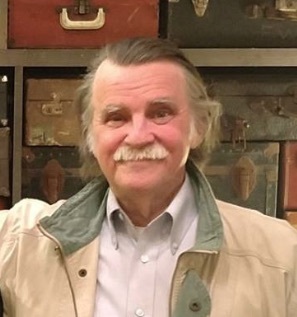 A group of business experts, meanwhile, addressed the financial aspects of exiting a business, including inventory reduction and financing, while David Brown of The Edge Retail Academy reminded jewelers that their business needs to generate wealth, not just provide a job. 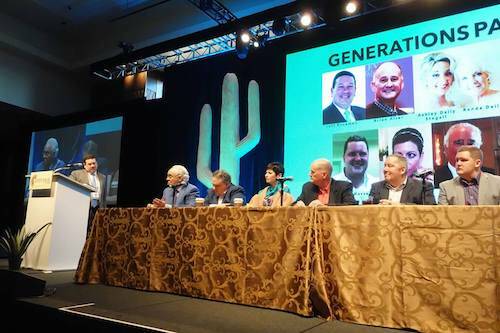 At Centurion 2017, a group of jewelers share strategies for successfully transitioning generations in the business. A major retailer, Ben Bridge, broke boundaries on two fronts by naming fifth-generation, 32-year-old Lisa Bridge—a Millennial—as both its youngest and first female president. And some longtime husband-and-wife jeweler teams talked about what keeps both their businesses and their marriages successful. Fifth-generation jeweler Lisa Bridge is the first female and first Millennial-age president of Ben Bridge Jeweler. Diamonds: Polished diamond prices continued to fall throughout 2017. At the end of November, the Rapaport index for one-carat polished diamonds had declined 5.5% year-to-date and 6.7% year-on-year. Half-carat stones were hit especially hard: -18.3% year-to-date for 2017 and -20.1% year-on-year from 2016. Smaller stones (0.3 ct.) were less impacted: the year-to-date drop was a modest 1.3% and the year-on-year dip was 1.1%. 3.0+ carat stones fared slightly better than one-caraters: -4.9% year-to-date and -3.8% year-on-year. But the biggest diamond issues remain unchanged from last year: undisclosed synthetics and attracting Millennials. With the Diamond Producers Association’s relaunch of generic category marketing in its second year, and both retailers and other key diamond brands (like Forevermark) shifting some of their messaging, diamonds are gaining a more modern image that appeals to Millennials and women. Indeed, the average price of a diamond engagement ring leapt 25%. The Diamond Producers' Association brought back generic diamond marketing but with updated messaging for Millennials. More and more synthetic diamonds are entering the marketplace as the number of firms that make them and/or use them in jewelry increases. But also growing are attempts to pass them off as natural and, of course, the number of devices that can help jewelers spot them better. But the crooks are going to greater lengths to profit too: GIA found a fake inscription on a synthetic stone, suggesting the issue may be spreading beyond melee to larger certificated stones. Disaster relief and other help: The jewelry industry is generous. In addition to the ongoing impacts made by Jewelers For Children and the Diamond Empowerment Fund, the industry also came together to help victims of the fall hurricanes. A group of goldsmiths traveled to remote parts of Africa to bring tools to artisanal jewelers. On an individual basis, jewelers across the country launched their own outreach efforts following multiple natural disasters, including the college-age granddaughter of one jeweler who single-handedly raised money for chartered airlifts of aid to her beleaguered homeland of Puerto Rico after Hurricane Maria, and others who did their best to help. Read their inspiring stories here, here, here, and here. 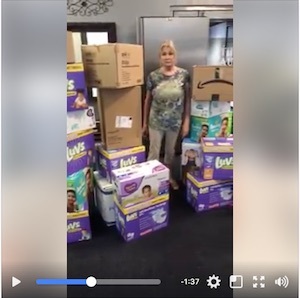 Above: Barbara Parker of Barbara Parker's Diamond Vault in Conroe, TX, turned her store into a relief center and clearinghouse for supplies for victims of Hurricane Harvey for more than a month following the storm. 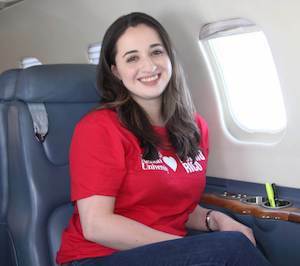 Below, Rosana Guernica, granddaughter of Marie-Helene Morrow of Reinhold Jewelers in Puerto Rico, singlehandedly raised enough funds to charter five large planes to fly relief missions to her homeland. Planes took food and medical supplies to the island and returned bringing critically ill patients to hospitals on the mainland. 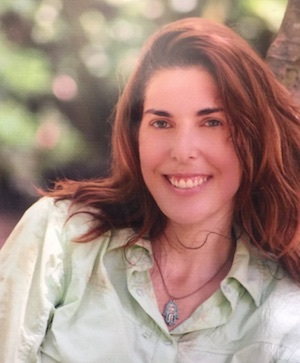 Separately, regular contributors to The Centurion Newsletter such as The Edge Retail Academy, Platinum Guild International, Vantage Group, and Preferred Jewelers’ Andie Weinman helped jewelers with sound advice for better sales and profits throughout the year. Some examples are here, here, here, here, here, and here. Politics: Today’s tense political climate hasn’t had a huge impact on jewelers, but it doesn’t mean they’re immune, and in The Centurion’s study of what keeps jewelers up at night, 16% said politics worries them. 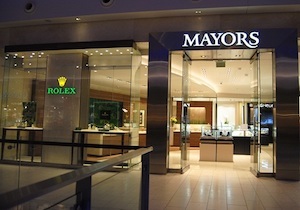 It’s not surprising: increasingly, jewelers will have to contend with issues like whether or not to dismiss an employee whose off-duty political views might impact the business. Meanwhile, the recent wave of sexual harassment scandals touched the jewelry industry slightly when Helzberg abruptly canceled its launch of the Marchesa jewelry line designed by Georgina Chapman. Chapman’s apparel line of the same name was financed by her husband, Harvey Weinstein, the Hollywood producer whose decades of sexual harassment was the spark that ignited the #metoo wave of women coming forward about abuse. Multiple female celebrities said that in addition to Weinstein’s unwanted advances, they also were coerced into wearing Marchesa for red-carpet appearances. 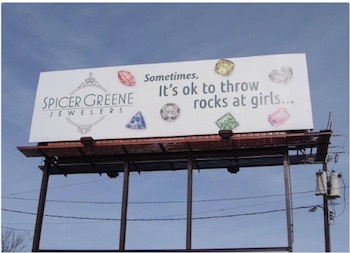 Sometimes even an innocent message misses the mark, as one jeweler found out when a humorous diamond billboard sparked outrage. Luckily, quick and effective crisis PR turned a potential disaster into a wave of support. A final farewell. 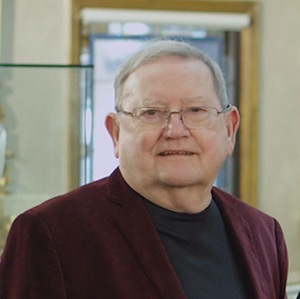 The jewelry industry bid a sad goodbye to some legendary names in 2017: retailers Murphy Jones of Sissy’s Log Cabin; Stephen Stanley of Stanley Jewelers Gemologist; Albert Solomon of Solomon’s Jewelers; Paul Wojcik of Nederland Jewelers; retired jeweler and AGS groundbreaker Sallie Morton; Alan Kadet of Rogers & Hollands; jeweler-to-the-stars Fred Leighton; and former retailer-turned-philanthropist Molly Mednikow. 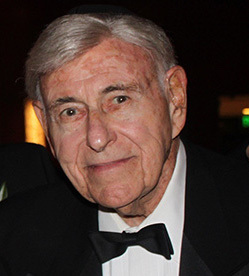 On the supplier side, the industry lost matriarch Perle Suna of Suna Bros.; sales rep Rick Wolf; designer Janel Russell; diamond broker Mark Boston, diamond dealer Lloyd Jaffe; and also lost respected veteran journalist William George Shuster. 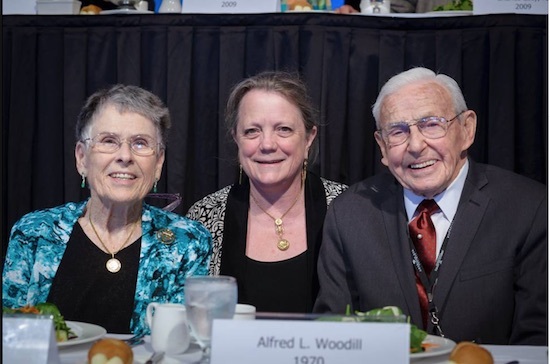 Above: The industry bid farewell to Murphy Jones, Albert Solomon, and Sallie Morton (pictured with Georgie Gleim and Al Woodill). Below, Molly Mednikow, Mark Boston, Lloyd Jaffe and William George Shuster.